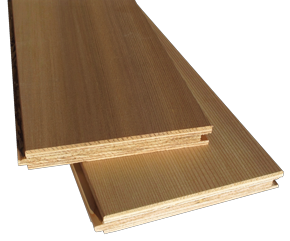 Shakertown is proud to now offer a new line of cedar panel products. Dolly Varden is clear, vertical grain Western Red Cedar (the highest grade), which is laminated to an exterior backing. This tongue and groove cedar panel system delivers a stronger, more durable engineered paneling with qualities not found in solid cedar. It can be used for exterior paneling on walls & soffits or interior walls & ceilings. Plus, Shakertown's Dolly Varden T&G can be applied direct to soffit joists in California's High Fire Severity Zone. See our Building Code Approval list to review the specifics. Shakertown's new Cedar Cove shingle panel system offers a mixed grain economy panel, perfect for wherever a solid finish is desired. Watch our new video showing how easy it is to install our Shakertown's Craftsman and Tahoe cedar shingle panels. Visit our dealer locator page to get more details on our cedar products, pricing and delivery options.